The Église évangélique mennonite de Montréal-Nord was the first Anabaptist/Mennonite church established in Quebec, Canada. A cooperative venture of Mennonite Board of Missions and Mennonite Conference of Ontario sent Tilman and Janet Martin to Montreal for French language study in 1956. The Martins chose Montréal-Nord, a poor suburb in the north of Montreal, because there was no French Protestant church in the area. Visitation started in 1957 while worship services began in 1958. Although intended as a French mission, certain contacts requested English worship as well. Early mission included door to door literature distribution, prison visits and visits of ex-prisoners. 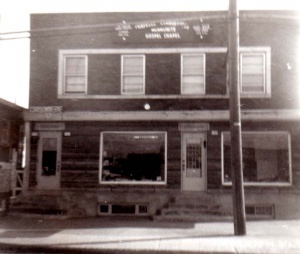 In 1960 a building was bought on Archévêque St. to house the Martins, with a commercial front used for a bookstore, chapel and coffee house. 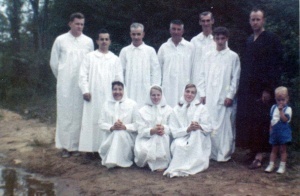 Many contacts led to eight baptisms in the summer of 1961. Despite this quick start the Église évangélique mennonite de Montréal-Nord remained unstable. Boys' and girls' clubs created contacts as did Summer Bible Schools, and a Christian bookstore. 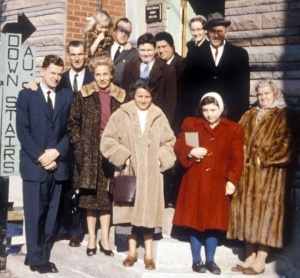 In 1961 a Last Days group attracted some of the congregation's youth to go off to Northern British Columbia and diminished the strength locally. As interest developed in a camping ministry near Joliette, Tilman Martin committed part of his time to that. In 1970 he took charge of the camping project and in 1971 moved to Joliette while continuing to be pastor of the Église évangélique mennonite de Montréal-Nord. No Mennonite workers were found to succeed the Martins. Albert and Suzanne Hodder from Salvation Army background did take up the challenge in 1972 and became pastors. The Hodder's interest in inner city ministry led to involvement in a project to start the House of Friendship. By 1973 many members had moved away from the Montréal-Nord area so the Archévêque St. building was sold to Youth with a Mission. The remaining members of Église évangélique mennonite de Montréal-Nord had to travel downtown to meet for worship at the House of Friendship building (120 Duluth St.) from 1973 till 1976. The congregation dissolved in 1976. This ended French ministry for Mennonite Conference of Ontario and Quebec on the island of Montreal. However the activity there provoked the creation of Mennonite camps, Mennonites in prison chaplaincy and the purchase of the House of Friendship. The language of worship was primarily French. Martin, Janet. Album II du protestantisme française en Amerique du Nord, Hervé Finès, ed. Montreal: L'Aurore, 1988: 67-68. Lougheed, Richard. "Église évangélique mennonite de Montréal Nord (Montréal Nord, Quebec, Canada)." Global Anabaptist Mennonite Encyclopedia Online. February 2008. Web. 23 Apr 2019. http://gameo.org/index.php?title=%C3%89glise_%C3%A9vang%C3%A9lique_mennonite_de_Montr%C3%A9al_Nord_(Montr%C3%A9al_Nord,_Quebec,_Canada)&oldid=133684. Lougheed, Richard. (February 2008). Église évangélique mennonite de Montréal Nord (Montréal Nord, Quebec, Canada). Global Anabaptist Mennonite Encyclopedia Online. Retrieved 23 April 2019, from http://gameo.org/index.php?title=%C3%89glise_%C3%A9vang%C3%A9lique_mennonite_de_Montr%C3%A9al_Nord_(Montr%C3%A9al_Nord,_Quebec,_Canada)&oldid=133684. This page was last modified on 24 February 2016, at 22:50.